I love it when my vices magically turn into virtues. Peanut butter? That’s a ‘good’ fat. Chocolate? Load up on those antioxidants. Coffee? It’s the new superfood. Chips? Ok. Maybe some things are just bad for you. But a new study just might be my new favorite. It says women who drink moderate amounts of alcohol don't gain as much weight in midlife as those who abstain. I’m sure they’re probably not talking about mudslides and margaritas (both of which have about 500 calories a serving … and who has just one serving??). Researchers at Brigham and Women's Hospital in Boston examined data from 19,220 women and found women who drank 15 to 30 grams a day -- the equivalent of a drink or two -- were 30% less likely to be overweight or obese at the end of the study than those who didn’t drink. 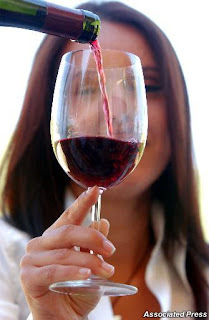 And the most effective beverage for curbing weight gain was red wine – my favorite! But don’t let this information go to your head – researchers warn against turning to an alcohol diet. Though I do think it would pair well with that cookie diet everyone talks about. This entry was posted by kate, on Thursday, March 11, 2010. You can leave your response .